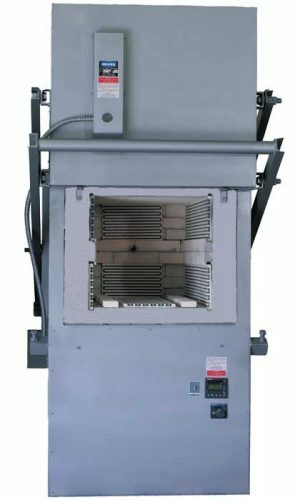 This mid-size heat treat furnace is designed for heavy duty, medium production jobs requiring controlled temperatures up to 2100°F continuous or 2250°F intermittent. CONTROLS: This Cress Medium Production Heat Treatment Furnace comes equipped with Cress Autotuning Microprocessor Based control mounted in the bottom skirt of the furnace. Contractor, Chromel-Alumel thermocouple and all wiring are included. A door limit switch is mounted on the furnace frame which automatically turns the elements off when the door is opened. A separate contractor, high limit control and solid state zero voltage switching of power to elements are standard. ELEMENTS: High temperature alloy wire elements are mounted in porcelain plates on walls and floor of the furnace and in grooves in brick of the door to provide all around heating and close gradients throughout furnace chamber. A ceramic hearth plate covers elements on the floor of the furnace. GENERAL CONSTRUCTION: This Cress mid-size heat treat furnace has a frame constructed of heavy steel angle and 18 gauge sheet steel metal panels are used to form the furnace exterior case. The production furnace case is finished in a pleasing gray hammertone. The vertical rising door is mounted on heavy levers and is opened by lifting up wide handle. The counter weight holds the door up in the raised position and the weight of the door gives a good brick to brick seal in the lowered position. This door protects the operator from burns because the hot surface always faces away from them. The front loading heat treat furnace door opens manually very smoothly and easily. All walls and door are constructed of 41/2″ of the finest quality insulating brick backed up by 2″ of 1800°F block insulation. This combination of insulation and wall thickness helps to give fast heat up and excellent heat retention for economical operation.